Surf Sony's Slider... say that 13 times straight. Sony today announced a number of new Vaio products, with Intel's new Haswell chips, a touchscreen and NFC across the range. 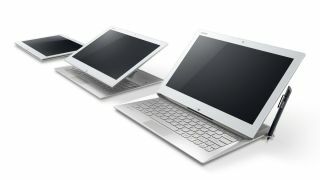 The Duo 11 hybrid gets a refresh in the form of the Duo 13, and as the name suggests, Sony has upped the screen size to 13.3 inches, though Sony has managed to keep it nearly the same size as the old Duo 11. The Duo 13 includes Sony's N-trig DuoSensePen for on-screen writing, with tweaks to the "Surf Slider" mechanism for easier transition between tablet and keyboard mode. The keyboard is full QWERTY with a touch pad, and Sony claims it will have 11 hours battery life. The Duo 13 will be available in early July and retail for AU$1699 (US$1400, roughly £1069). Using carbon fibre casing, Sony is touting it's new Vaio Pro series as the world's lightest touchscreen ultrabook, weighing in at 870 grams and 1.06kg for the Pro 11 and Pro 13, respectively. "Carbon fibre has an unparalleled strength-to-weight ratio when it comes to laptops. This is what makes the VAIO Pro not only the world's lightest, but also extremely robust," said Jun Yoon, marketing manager for network entertainment at Sony Australia. While details of the internal configurations have not been released yet, Sony will be using the same Triluminos Display technology used in its Bravia TV range across the range. Sony has also indicated that it will be using the Windows 8 platform for its new releases. Available from early June, the Pro 11 will retail for AU$1299 (US$1150, roughly £817), and the Pro 13 will retail for AU$1399 (US$1250, roughly £880).